After a really long day in the lab, Sarah, Dave, Angela, Elena and I grabbed dinner and decided to go hiking up Observation Hill. Well, it’s not really a hill like we’re used to. This hill is a 1500 ft, super steep climb that is all loose volcanic rocks and boulders. It’s a great post-dinner activity down here at McMurdo, or a great way to accidentally break a leg after eating too much. JK. During our hike up there were three stopping points for picture taking and to catch your breath. First is a plateau where there are several communication repeaters and a plaque dedicated to the PM-3A medium power nuclear power plant that once supplied energy to McMurdo in the early 1970s. 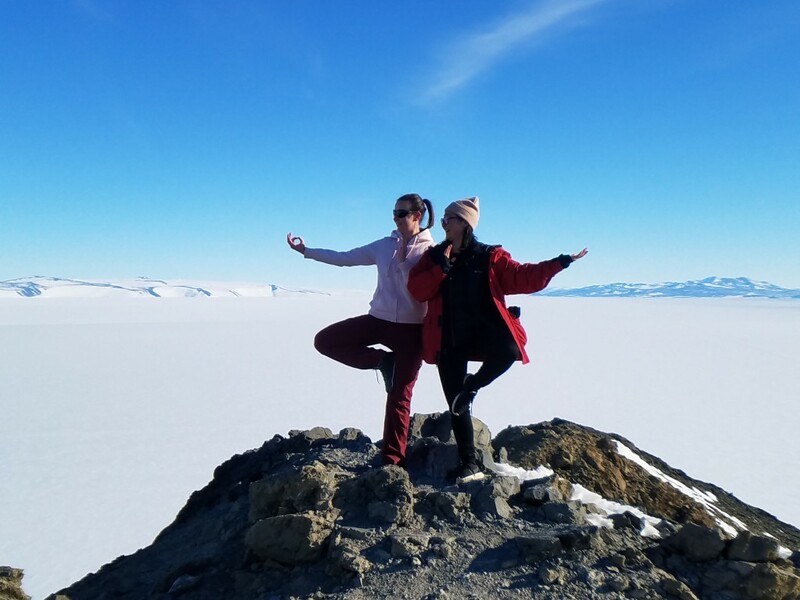 Figure 1: Elena and Angela at the summit. 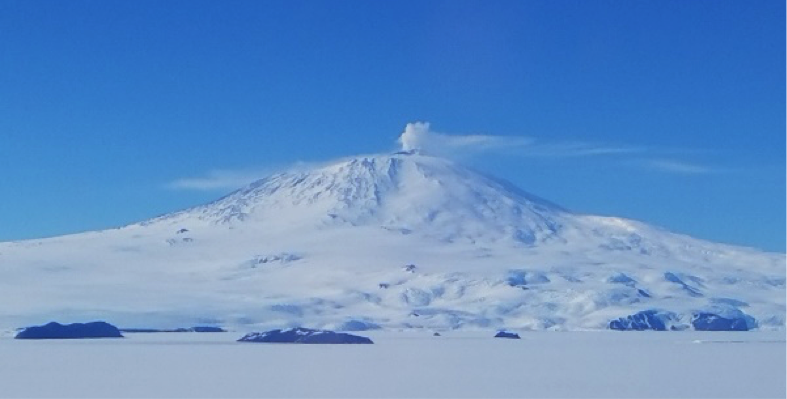 This entry was posted in Antarctica 2016 on December 21, 2016 by Scott Tighe. 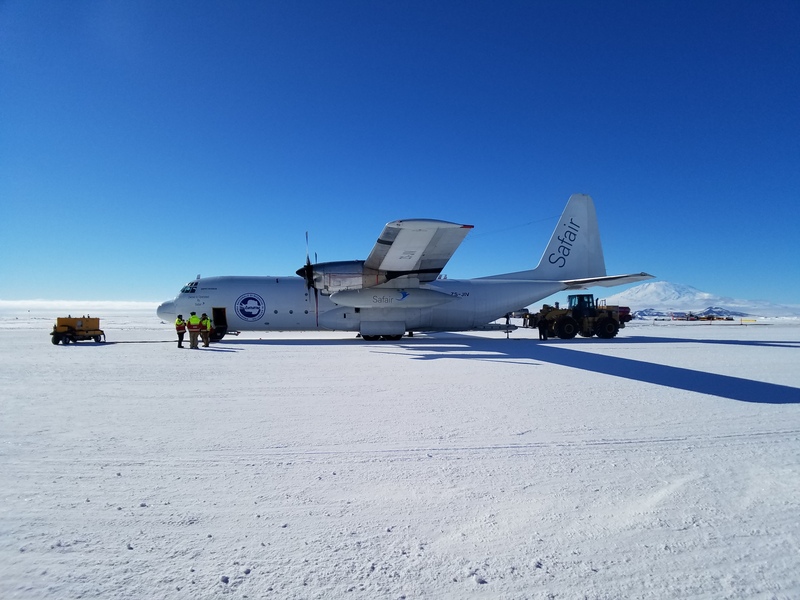 The amazing journey from the Antarctica Research Center in Christchurch, New Zealand to “The Ice” started with a 8 hour flight in a C130 Hercules airplane (aka The Herc). After a 24 hour delay (because of weather in McMurdo) we finally got clearance to depart and start our journey. We headed through a NZ military security screening gate area and boarded the shuttle to the C130 boarding area… and then…BANG…it hit me; all of a sudden my lifelong dream of going to this remote continent was becoming real. No turning back now! Talk is cheap, but when you’re looking at that C130, it really sinks in. This was really happening and that’s when then butterflies and anxiousness began. 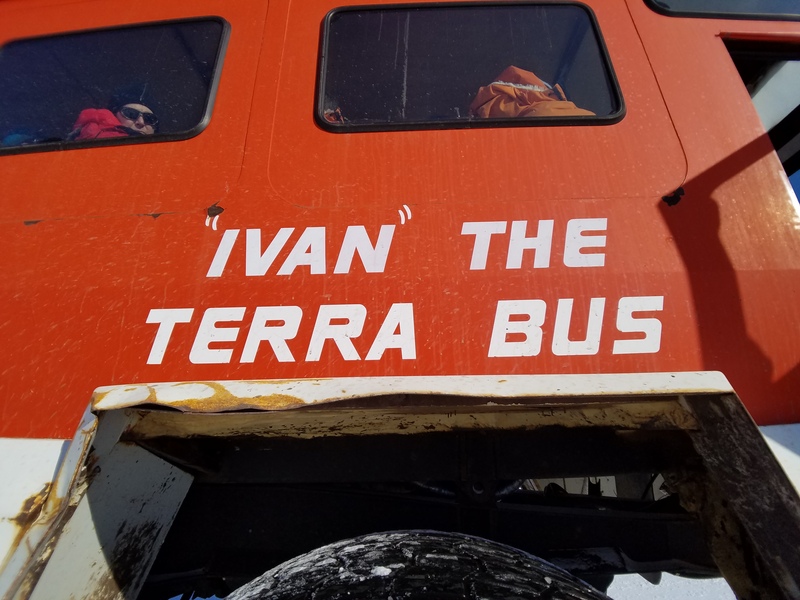 Sarah’s been to Antarctica before, but it was all new and all unknown for a first timer like me. When we boarded the C130 (SAFAIR of South Africa), we were handed a brown bag lunch. We all piled in and found a seat. The plane was truly a military style C130 and had 45 standard comair style seating along with a ton of cargo. The flight crew were all military personal and gave us a safety briefing, some water, and ear plugs. Ear plugs were definitely required because it was noisy. Very noisy. Elena was the smart one in our group. She brought a set of Bose noise cancelling head phones- a true asset for this flight! After takeoff, the flight was smooth and it didn’t take long for the butterflies to go anyway. During the flight, the pilots allowed us to spend some time in the cockpit. It was amazing… Awesome sights as we approached Antarctica. Much to my surprise, they used both Celestial navigation (by tracking the position of the sun) and GPS because we were too close to the magnetic south pole for traditional NAVs. Pretty cool. They even took time out to teach me how to use sight reduction tables. Not just an overview, but calculators and reference books! I guess you could call it the beginning of my Antarctica endless training program. As we approached the continent, everyone was excited- looking out the windows, talking, chattering, laughing, a lot of oohh’s and Aahh’s … The excitement was electrifying. We were almost there. We landed on the ice runway called Pegasus Field (NZPG). It was breathtaking! We scrambled to get on our ECW gear and get out of the plane so we could finally step foot on Antarctica. This was definitely a moment to behold forever! White everywhere! Snow and Ice and very unusual shuttle vehicles. We finally made it! Figure 1. Our ride onto Continent. Figure 2. Our ride into town! This entry was posted in Antarctica 2016 and tagged antarctica on December 1, 2016 by Scott Tighe.